Former president Prevaiz Musharraf will be tried under article 6, said the interior minister Chaudhary Nisar in a press conference on Sunday. He said this when Musharraf was initally realesed by the authorties of Adiala jail on 6th November when he got the bail by the local court. His house was turned in to the sub jail during his trial. The interior Minister told the reporters that a three member bench will be formed by the Chief Justice of the supreme court. The bench will analyse that whether his act emergency was a one man show or he was single handedly responsible for the emergency during his regime. If proven guilty, he might has to face serious punishment which could be death plenty. 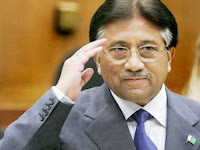 We cannot forget the role of Army in this particular matter but the question arises that if Musharraf is charged whether he will be helped by the army or not.